Prior to major advances in fisheries technologies, such as trawl nets, steamships, and radar, annual catches of fish were measured in kilograms. A new data set shows how marine fishing has changed over time. For thousands of years, seafood has sustained communities, livelihoods, and economies across the world. In ancient Rome, wealthy entrepreneurs snapped up beachfront property and built elaborate fish farms. In 15th-century Chile, coastal people bartered shellfish for inland resources. The Vikings living on Norway’s Lofoten Islands were fierce and powerful raiders, but they were also prodigious fishers of Atlantic cod. Over millennia, shifts in politics and changing technology have drastically altered when and where people go to fish. But accurate scientific records of this vast history of fishing activity capture, at best, a tiny sliver of the whole. Most scientific studies of global fishing patterns only extend back to the 1950s, when groups such as the United Nations Food and Agriculture Organization began keeping detailed records. Today, these mid-century records are used as the baseline against which modern fisheries data is compared when making decisions about fisheries management and marine conservation. But Reg Watson, a fisheries ecologist at the University of Tasmania, was unsatisfied with this truncated view of history. 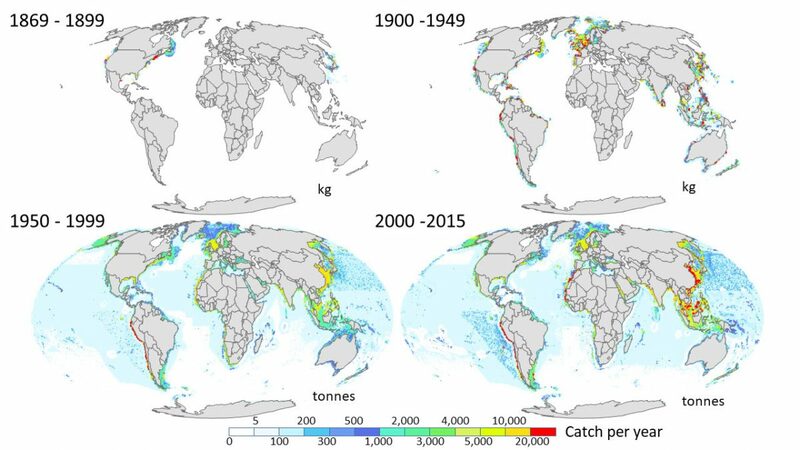 Over the past 150 years, global fishing activity has been concentrated in hotspots. Advances in navigational, shipping, and storage technologies have enabled fishing vessels to spread out around the globe, while changes in politics and economics have shifted the locations of peak fishing activity. In a new research effort, Watson and his colleague Alex Tidd, a fisheries scientist at the Galway-Mayo Institute of Technology in Ireland, scoured online databases, regional management records, vessel-tracking satellites, and historical records dating back to 1869 to produce the first comprehensive maps of global marine fishing over the past 150 years. The study doesn’t account for the full history of fishing, of course, but it does reveal detailed patterns of fishing across countries, including differences in catch composition and fishing gear, for a much bigger period of history than previous records. Watson and Tidd’s reconstructed records also estimated the rates of illegal, unreported, and discarded catch. Watson says examining fishing trends over such a long period offers a glimpse of how fishing has changed marine biodiversity. Looking back in time gives researchers a clearer idea of historical fish populations before they were heavily exploited by modern industrial fishing. This information can be used to assess the sustainability of modern fishing activity. “It’s like playing a detective game,” says Watson. Fisheries ecologist Chris Wilcox was not involved in the research effort but is already putting Watson’s findings to use. Wilcox’s team at the Australian government’s Commonwealth Scientific and Industrial Research Organisation is using the data to investigate the link between fishing activity and seal entanglement. By examining fishing levels in regions where there are seal colonies, the researchers will be able to gauge whether discarded fishing gear is the main cause of seal entanglement. Many organizations, such as Global Fishing Watch, keep an eye on large-scale commercial fishing. But Wilcox says Watson’s maps reconstruct the difficult aspects, such as how much smaller vessels caught or the amount of illegal catch. “It has a lot of value for people who are trying to understand how fisheries are depleting ecosystems,” explains Wilcox. The findings show that before 1900, the United States, Canada, and Japan had the most active fisheries. Even still, landings were recorded in kilograms, not tonnes, and the majority of fish were bottom-dwellers and small pelagic species. After the turn of the century, the United Kingdom caught up, with recorded landings peaking in the 1930s and 1940s. 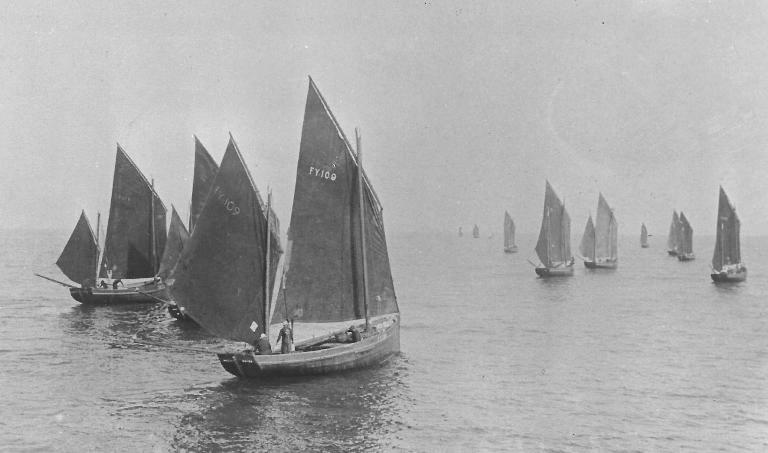 Technological change spurred a new era of offshore fishing in the first half of the 20th century as sails and oars were replaced with diesel and steam, enabling vessels to travel farther and withstand stormy seas. While the Second World War slowed fisheries expansion, the industry rebounded to full force during the 1950s economic boom. The world’s first freezer trawler, the Fair Try, was launched in 1953 and paved the way for more distant voyages and global trading. Fleets began to trawl the seafloor and undertook long voyages to catch tuna, squid, and shrimp. Some poorer countries reduced their own commercial fishing and allowed foreign fleets into their waters. Japan, Peru, and Russia crept to the top of the list for global fisheries landings. The country ramped up its global fleet in the early 2000s, its vessels roaming foreign waters more than its own. 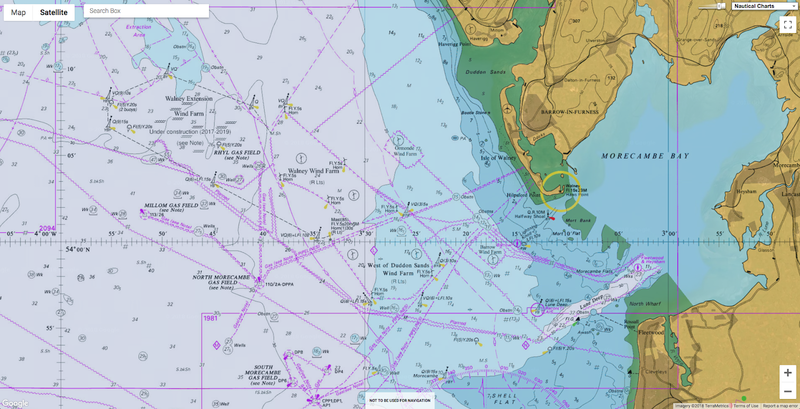 Technological advancements, such as sonar and radar, have enabled fishing vessels to track sea conditions and work through the night. While industrial fleets are traveling farther and fishing deeper than a century ago, the number of fish caught has actually been falling since the 1990s. Watson says the reasons differ across the world. In some areas, fishing has been curtailed in the interest of sustainable management. In others, the sea has simply been overfished. Global fisheries have evolved greatly over the past 150 years. According to Watson, the next 150 could see important changes, too. In particular, he sees a number of challenges. Demand for seafood may rise even further as food systems on land falter under climate change, he says. But if fuel becomes a more limited resource, fleets may not be able to travel as far offshore as they currently do. This may result in an expansion of aquaculture, which could place even more pressure on coastlines. “We’re beginning to see how everything is connected,” says Watson. Revolve : Overfishing – What’s Left In Our Oceans? The world's largest offshore windfarm has opened off the Cumbrian coast. Walney Extension covers 145 sq km of the Irish Sea and has a capacity of 659 megawatts, enough energy to power 590,000 homes. The project is a sign of how dramatically wind technology has progressed in the past five years since the previous biggest, the London Array, was finished. The new windfarm uses less than half the number of turbines but is more powerful. The energy minister Claire Perry said the scheme would help the UK, the world’s number one in offshore wind installations, to consolidate its leadership and create thousands of high-quality jobs. 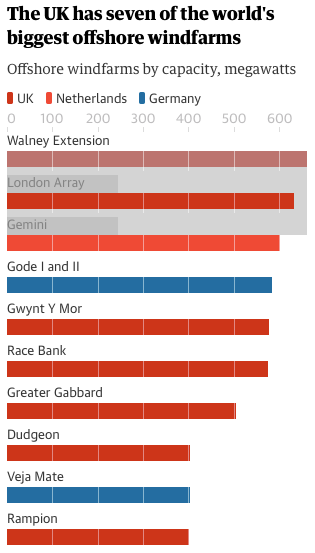 The supersizing of windfarms around the British coastline means Walney Extension will not hold its title for long. ScottishPower’s East Anglia One will be bigger at 714MW when it opens in 2020. 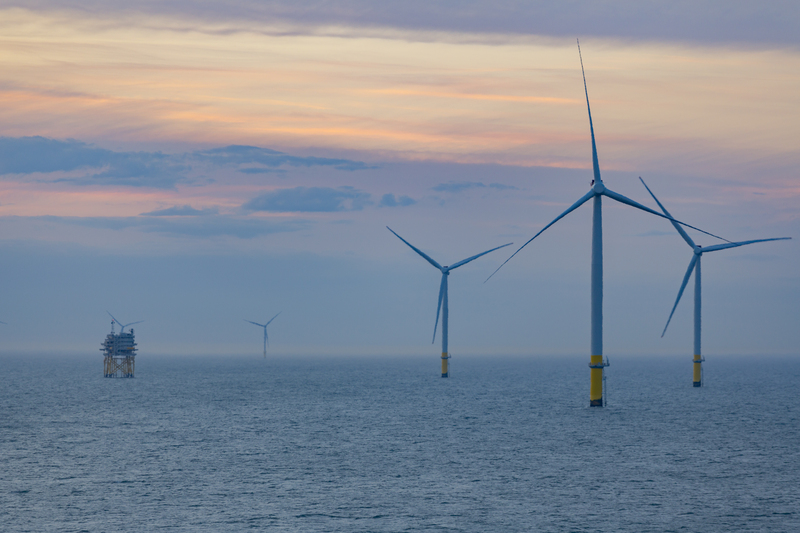 Ørsted itself has even larger schemes in the works, including Hornsea One and Two (1,200MW and 1,800MW, respectively) off the Yorkshire coast. Wright said it was “fantastic news” that ministers had recently committed to a timetable of auctions for clean energy subsidies every two years, starting in 2019. He said it was too early to say whether the company would submit its Hornsea Three windfarm, capable of powering 2m homes, into next year’s auction. This massive feat of engineering was constructed on time and within budget, together with Ørsted and partners PKA and PFA. But the executive warned that leaving the EU posed the risk of short-term disruption, and seamless borders and free-trade were important to Ørsted. “A hard Brexit or a last-minute no deal is probably the thing that would cause a problem in terms of supply chains and movement of goods and people,” he said. featuring both the Isle of Man and the newly upgraded Walney wind farm. In the long-term, however, any form of Brexit would not change the firm’s interest in the UK and the fundamentals of the market. “We can deal with it,” he said. Wright said he was unfazed by the ‘wind drought’ that the heatwave brought to much of Europe this summer. “We will see some low wind periods, some high wind outputs,” he said. But the record-breaking temperatures and wildfires would likely strengthen political action on global warming, he thought. “It does tend to focus the mind a little in terms of climate and energy policy. I think it does have an effect,” he said. Offshore windfarms provide nearly a tenth of the UK’s electricity. 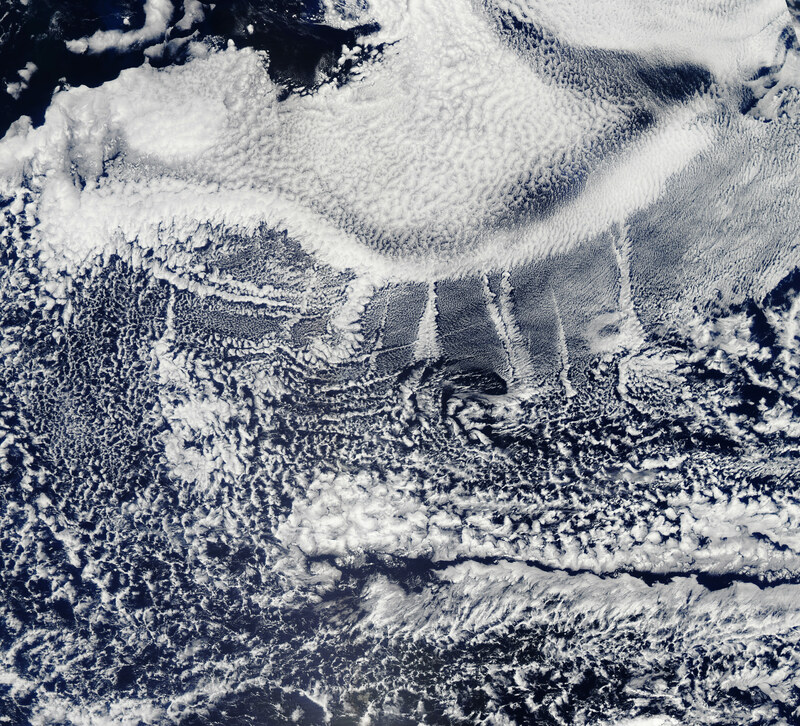 Long, narrow clouds stood out against the backdrop of marine clouds blanketing much of the North Pacific Ocean. Known as ship tracks, the distinctive cloud lines form when water vapor condenses around the tiny particles emitted by ships in their exhaust. 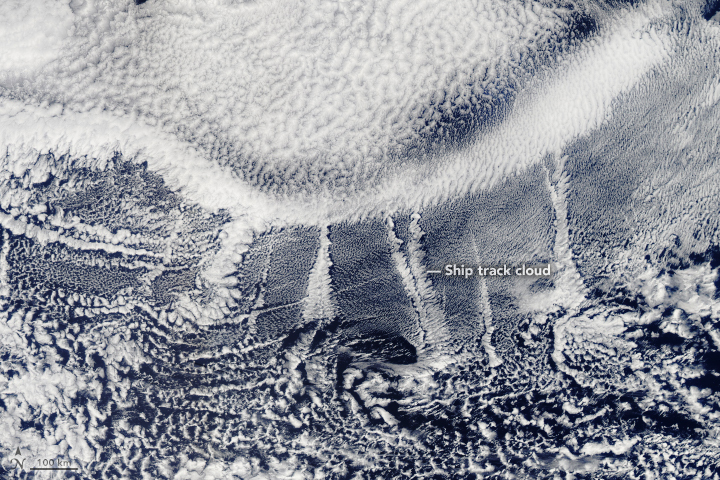 Ship tracks typically form in areas where thin, low-lying stratus and cumulus clouds are present. In August 2018, long, narrow clouds stood out against the backdrop of marine clouds blanketing much of the North Pacific Ocean. Known as ship tracks, the distinctive clouds form when water vapor condenses around the tiny particles emitted by ships in their exhaust. Some particles generated by ships (especially sulfates) are soluble in water and serve as the seeds around which cloud droplets form. Clouds infused with ship exhaust have more and smaller droplets than unpolluted clouds. As a result, the light hitting the polluted clouds scatters in many directions, making them appear especially bright and thick. The Moderate Resolution Imaging Spectroradiometer (MODIS) on Aqua captured this natural-color image of several ship tracks extending northward on August 26, 2018. The clouds were located about 1,000 kilometers (600 miles) west of the California-Oregon border. Similar environmental conditions also triggered the formation of ship tracks in this part of the Pacific on August 27 and 28. An analysis of one year of satellite observations from the Advanced Along Track Scanning Radiometer (AATSR) on the European Space Agency’s Enivisat indicates that very low clouds are most often present off the west coasts of North and South America. The large number of ships traversing the North Pacific, combined with all of the low clouds, make ship tracks more common here than anywhere else in the world. Roughly two-thirds of the world’s ship tracks are found in the Pacific, according to the study. Other ship track hotspots were in the North Atlantic, off the west coast of southern Africa, and off the west coast of South America. The research team also detected a clear seasonality in their occurrence: they are most often observed in May, June, and July, and only occasionally present in December, January, and February. Ship traffic is roughly constant throughout the year, so the cycle is mostly due to seasonal changes in the abundance of very low clouds. NASA Earth Observatory image by Lauren Dauphin, using MODIS data from LANCE/EOSDIS Rapid Response. 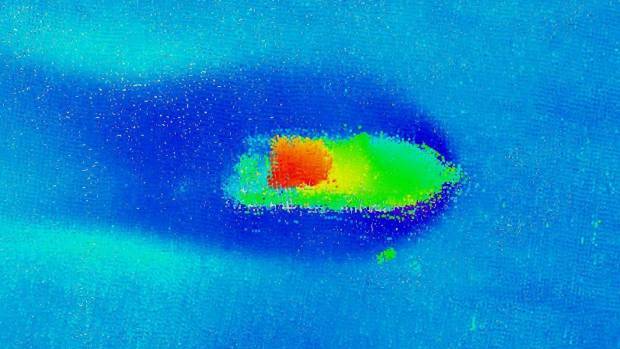 Story by Adam Voiland, with information from Bastiaan van Diedenhoven (NASA GISS). NIWA marine geologist John Mitchell gives a brief history of bathymetric (seabed) charting, and how it's been carried out over the last few hundred years. Today, a high-tech survey project has mapped the bottom of Queen Charlotte Sound and Tory Channel in unprecedented detail. An "alien landscape" of pockmarks and desert-like dunes lies beneath the surface of the Marlborough Sounds, a soundwave survey has revealed. 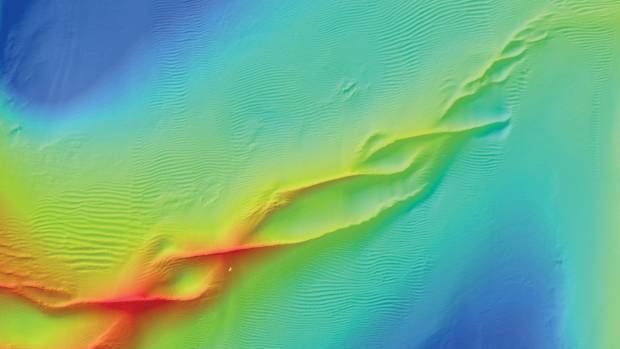 Large circular scars, smaller pockmarks, holes 20 metres deep and high ridges "like what you see in the Sahara Desert" have been captured in the most extensive coastal underwater mapping project in New Zealand. The bottom of Waikawa Bay is covered in circular pockmarks from boat moorings. 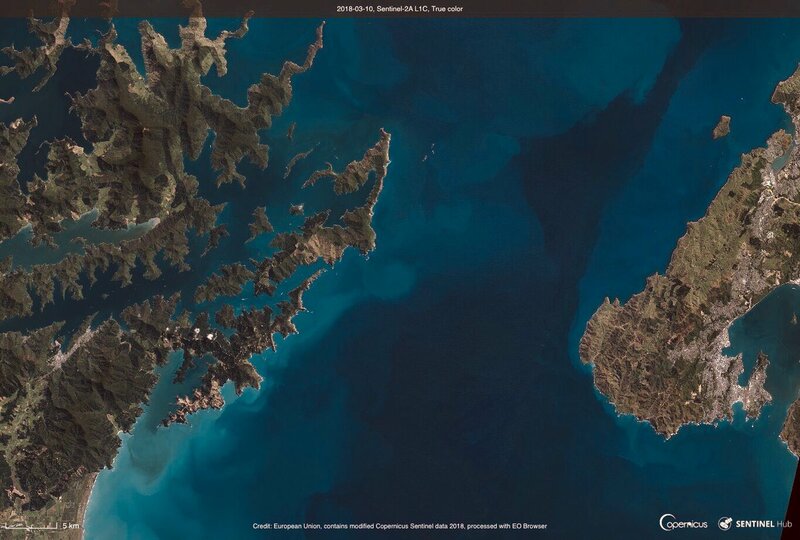 Niwa operations general manager and marine geologist Dr Helen Neil presented 3-D images, videos and maps to the public on Thursday, describing the dramatic underwater landscape of Tōtaranui/Queen Charlotte Sound and Kura Te Au/Tory Channel. 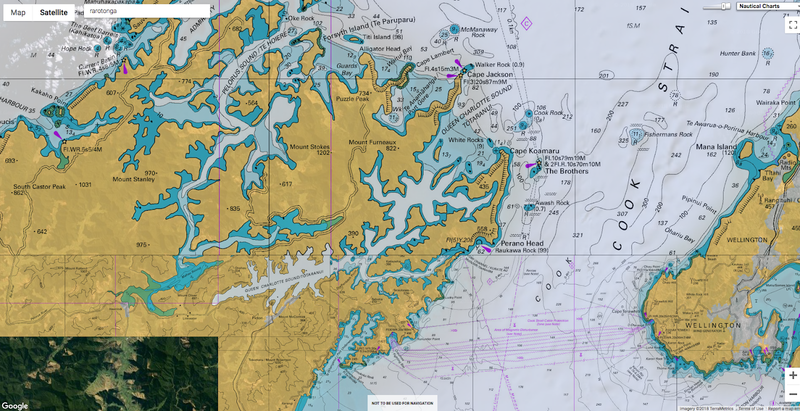 "There is so much more underneath the water than what we had in our nautical charts," Neil said. 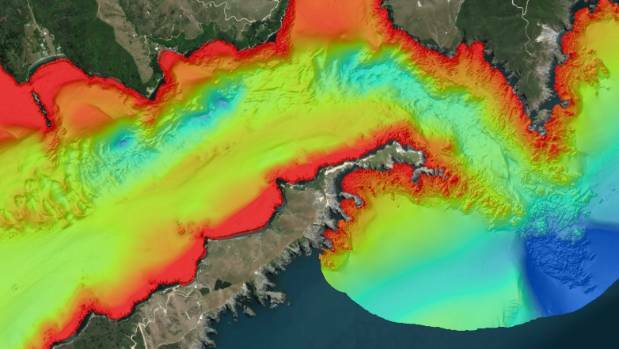 Two Niwa boats and survey experts from Discovery Marine spent 280 days using soundwaves to map more than 5 billion data points, over 43,000 hectares. The Marlborough District Council and Land Information New Zealand commissioned the survey in 2016. 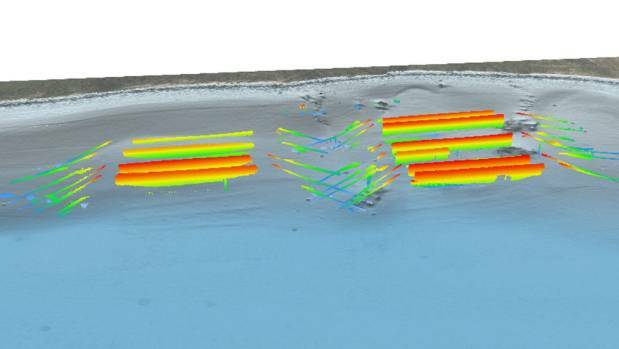 The soundwave survey reveals sediment waves. 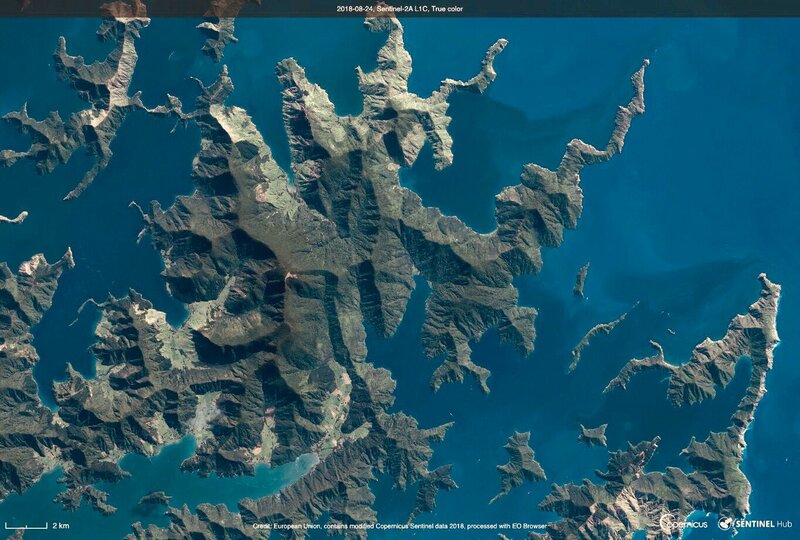 The large circular pockmarks marred the bottom of Waikawa Bay, near Picton, like a rash. 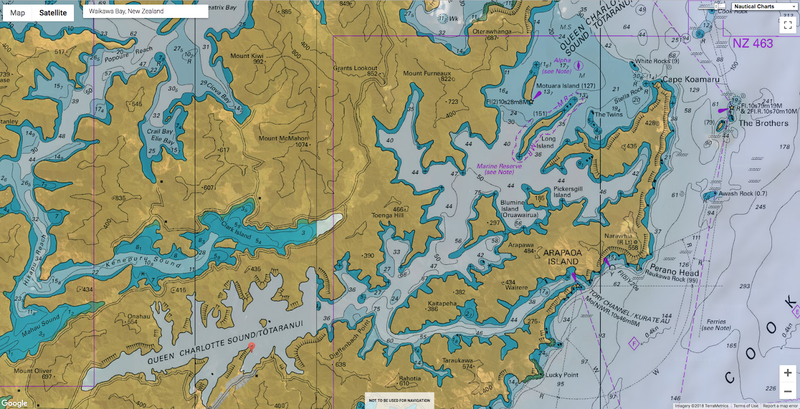 They also showed up in other bays popular with boaties, such as Endeavour Inlet and Bay of Many Coves. Council resource management adviser Jon Cunliffe said the pockmarks in Waikawa were from boat mooring chains, dragging on the sea floor as boats moved in the tides. Boaties would now know how deep the water was, and how long their mooring chains should be. 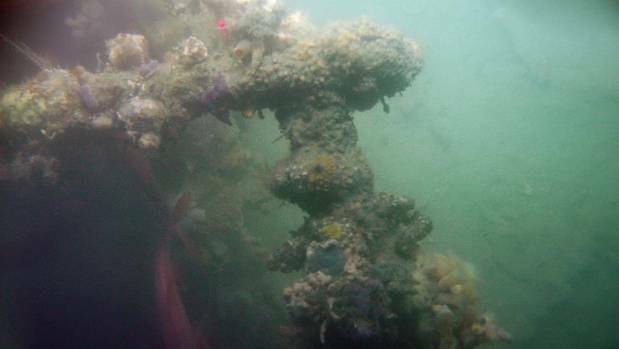 The Hippalos sunk near Blumine Island in 1909 and has become an artificial reef with sponges, anemones and crabs. The old maps from 1942 were up to 3 metres off in places, Cunliffe said. They should swap their concrete block and chain moorings for space-efficient elastic moorings, which meant more space in the harbour as boats would not move so much, and fewer scars on the sea floor, Cunliffe said. A previously uncharted 10-metre long launch north of Motuara Island, at the mouth of Tōtaranui/Queen Charlotte Sound. The council hoped 100 boaties in Waikawa Bay would adopt the new moorings, but would consult them individually, Cunliffe said. Other smaller pockmarks were from freshwater and gas-rich fluids seeping from underground. The council could investigate them further, possibly looking at any impact on nearby marine farms, Neil suggested. 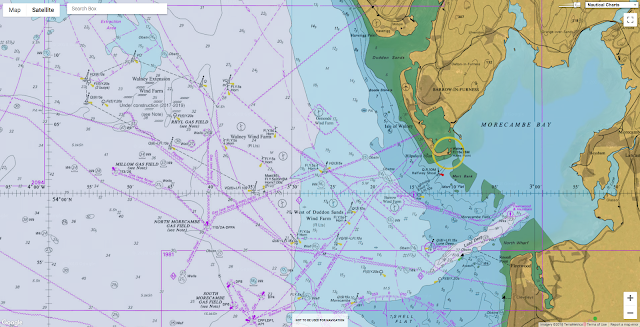 The council was considering a soundwave survey of Te Hoiere/Pelorus Sound. The Sounds were created when steep river valleys were flooded about 5 million years ago, creating a rugged underwater terrain. 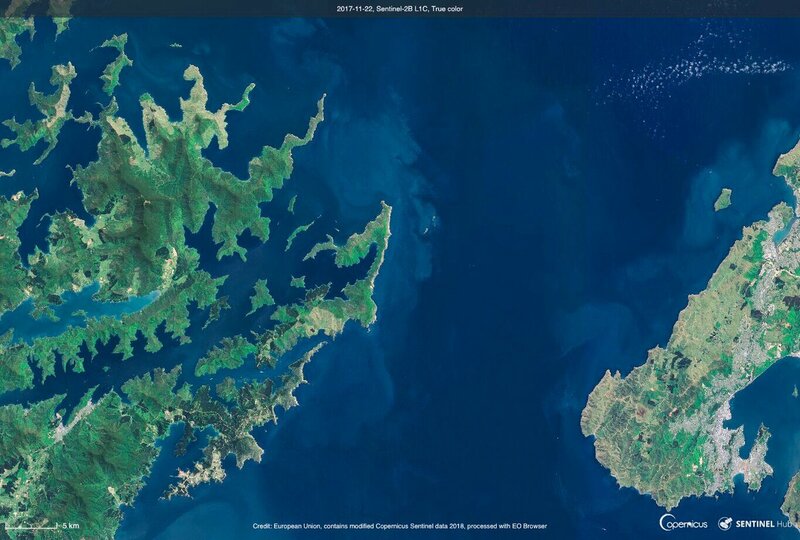 The northern end of Tōtaranui/Queen Charlotte Sound had a shallow bar which blocked the notoriously tidal Cook Strait from affecting its calm waters. Neil's team found complex rocky reefs with extensive kelp habitats, and last year found shipwrecks that had become artificial reefs. Some of the 10 shipwrecks found were previously undiscovered, but none were of interest to police, Neil said. Most were modern launches. The oldest one was the Hippalos which sunk in 1909, known to divers but never mapped. 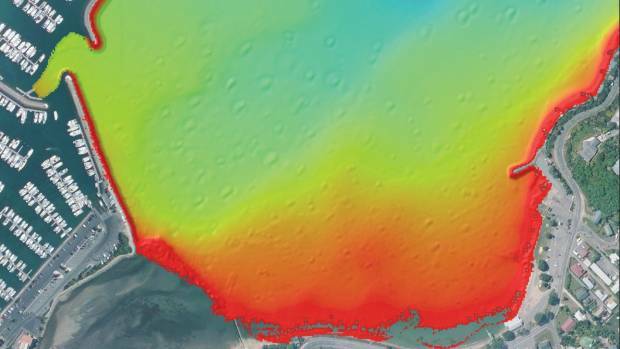 This bathymetric map shows the shallows in red and the depths in blue at the mouth of Kura Te Au/Tory Channel. 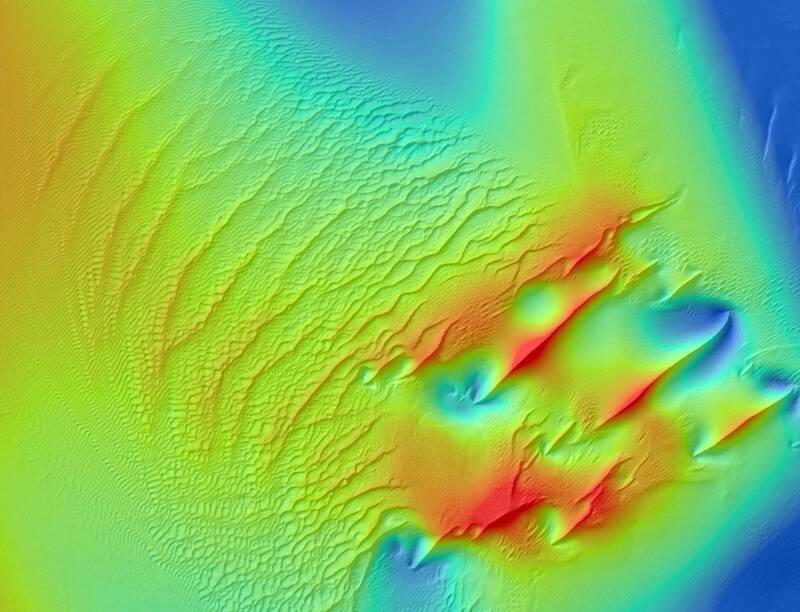 The survey also mapped man-made features, such as underwater marine farms, pipelines and a trench dug in the 1940s for a war-time communications cable. Bathymetric images reveal the shape of marine farms underwater. The results would be a foundation for other science projects in the region, she said. A project on juvenile fish habitats by the Ministry for Business, Innovation and Enterprise was already using the data. "This is a nationally significant project, using cutting-edge science, that will benefit the thousands of people who use the Marlborough Sounds year-round for business or recreation." Marlborough Mayor John Leggett said the data would help the council manage coastal resources, and protect the biodiversity of the Sounds, "the jewel in Marlborough's crown". Cook Strait (Māori: Te Moana-o-Raukawa) lies between the North and South Islands of NewZealand, and runs next to the capital city, Wellington. British and French fishing boats ram each other in the Channel in a long-running dispute over the rights to shellfish beds. Stones and smoke bombs were also thrown. 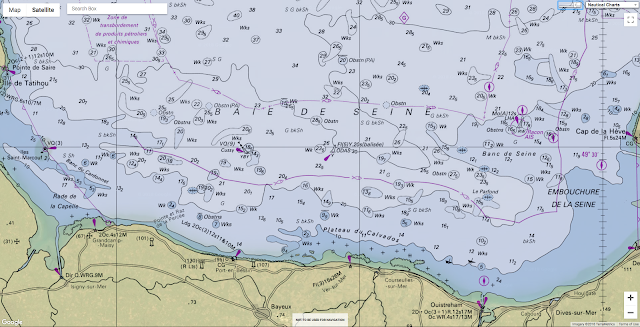 UK boats are legally allowed to fish for scallops in the bay off Normandy all year round, but French vessels are restricted to certain months to allow stocks to replenish. Fishing groups are calling for a new deal to be brokered between the two nations over when and where scallops can be collected. The conflict has remained unresolved for 15 years. French and British fishermen clashed in the English Channel Tuesday in the latest installment of the long-running "scallop war." Video of the incident broadcast by France 3 Normandie showed smoke bombs and rocks being thrown at British crews, while a number of boats appeared to be rammed. The five British boats, greatly outnumbered by an estimated 35 French vessels, were chased from the scallop-rich Baie de Seine area off Normandy, maritime official Ingrid Parot told AFP. "We're trying to push the English out because if we allow them to carry on they'll pillage the area," French fisherman Anthony Quesnel says in the video. "We have quotas, we have hours and they have nothing, no quotas, seven days out of seven they fill their boats. They come, they dredge and they fill their vessel and they go home. They work a month earlier than us and they leave us the crumbs," he added. The skirmish took place 12 nautical miles off the Normandy coast where British crews are allowed to fish all year round, while their French counterparts are restricted to a shorter harvesting season from October 1 to May 15. "I condemn the violence on both sides though the English did have much bigger boats than we did," Normandy fishing chief Dimitri Rogoff told CNN. "The French were just trying to push them up north. Yes, legally they're (the British) allowed to be there but we contest this right. There's a Common Fisheries Policy and on the French side we have quotas but for the English it's open bar!" The French feel British fishermen are attempting to deplete stocks before the start of the harvesting season. 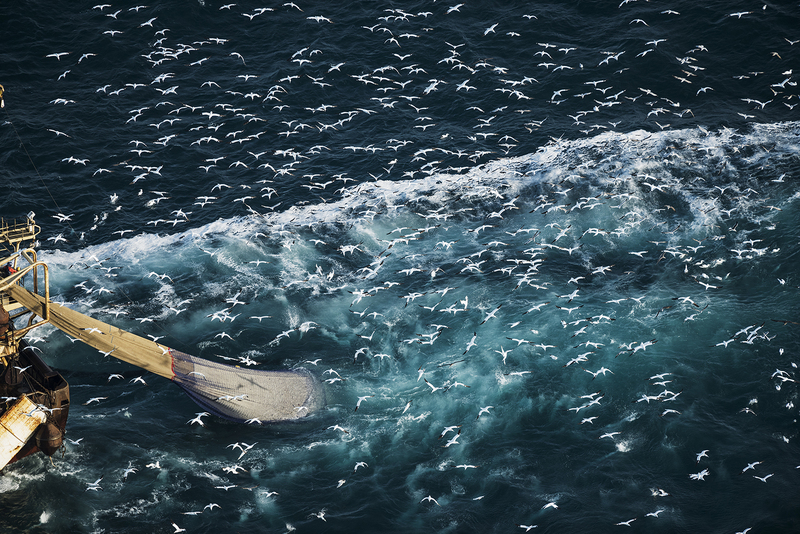 The problem has grown worse over the past 15 years as British boats have increased their catches considerably. While the two sides have reached agreements over the past five years, the French blocked a deal this year, he added. There is also frustration from French fishermen that the British use bigger trawlers, some of which are double the size of their French counterparts and also have the ability to freeze scallops on board. "We didn't sign the annual agreement because we want to change certain aspects of it and the English won't budge, which is a shame," Rogoff said. "We want better management of those fishing zones. We don't start fishing until the 1st of October and they arrived on the 22nd of August. We just want everyone to start fishing at the same time." A Scottish scallop dredger, right, docked at Shoreham, England, on Wednesday, a day after clashes with French fishermen off France’s northern coast. Britain's National Federation of Fishermen's Organisations has urged calm and said any differences should be resolved through negotiation. "We have raised the matter with the British government and asked for protection for our vessels, which are fishing legitimately," Chief Executive Barrie Deas told the BBC. "The deeper issues behind the clashes should be settled by talking around the table, not on the high seas where people could be hurt." Catherine Paul from the French Regional Committee of Fishermen told CNN that her organization had "tried to calm the fishermen and to have talks with the English for better management of the scallops." In a statement, a spokeswoman for the UK's Department for Environment, Food and Rural Affairs said: "We are aware of reports of aggression directed towards UK fishing vessels in an area of the English Channel not under UK control. 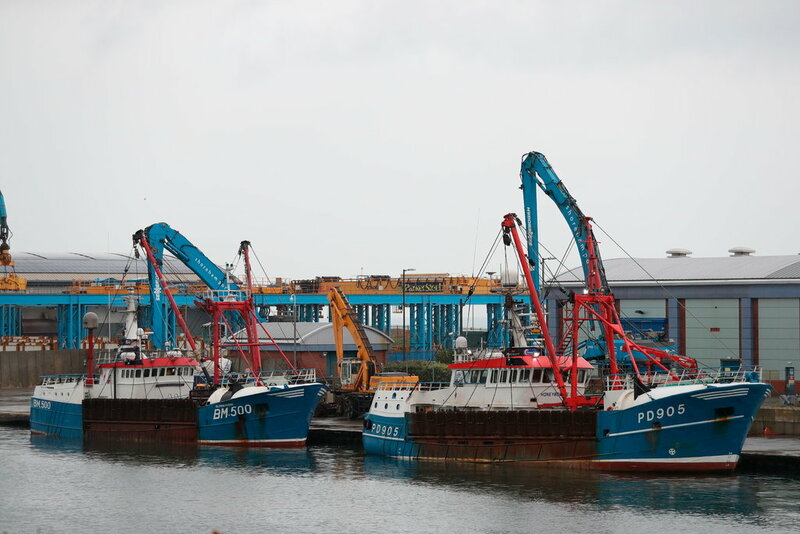 These vessels were operating in an area they are legally entitled to fish. "The safety of the UK fleet is our highest priority, and we will continue to monitor the presence and activities of vessels in the area. We are in contact with industry and the French administration to encourage meaningful dialogue and prevent further incidents from occurring." 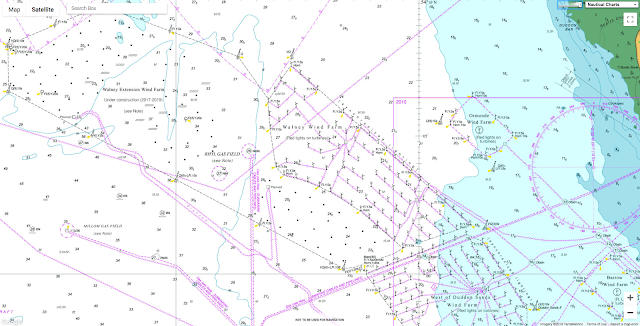 Financial Times : What caused the 'scallop war' in the English Channel? 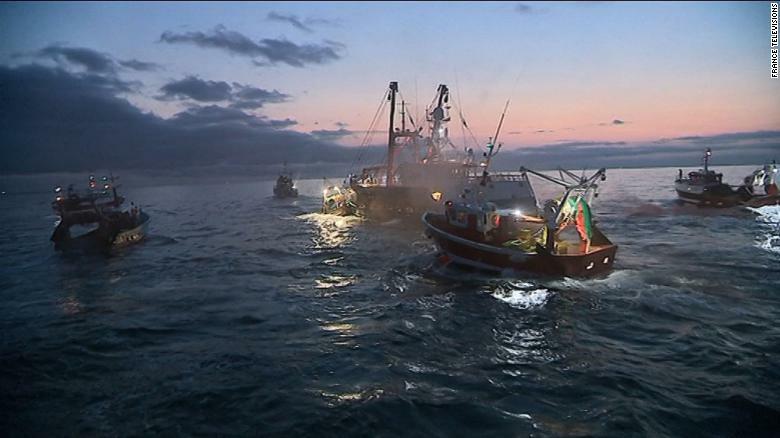 BBC : Reality Check: What are the rules on scallops? / Scallop wars: Could Brexit calm troubled waters? The Mediterranean Sea concentrates many challenges: tourism, transport, fishing, biodiversity. Considerable efforts have been made over the past 30 years to preserve it. Scientists monitor the state of health of the Mediterranean Sea through biological monitoring of its richest and most sensitive ecosystems such as posidonia meadows and coralligenous reefs, listening to underwater sounds and bottom mapping. Through the magnificent underwater images of Roberto Rinaldi and Laurent Ballesta, you will dive into the heart of the Mediterranean Sea and its biodiversity to better understand why/how it is monitored. You will also discover the latest improvement actions implemented and their results.